STOCK ALERT! Item is now sold out for this season. Please see our other Vornado Energy Smart Fan for current stock. The Vornado Energy Smart 683DC pedestal fan is an energy saving floor-standing fan. Uses up to 80% less energy than other pedestal fans. Adjustable height from 80 - 96 cm on a stable pedestal base. Adjustable dial to control airflow, noise & power usage. Looking for a smaller fan? See the Vornado 533DC Compact DC Fan. Fans are an ideal way to increase thermal comfort. They create a breeze which cools occupants through the wind chill effect. Paired with air conditioning, fans allow you to increase the set point on hot days. Or switch the air con off all together in mild weather. While pedestal fans are generally quite useful, most are poorly made. They use inexpensive, noisy, and inefficient AC motors. It's not hard to see why broken fans often pile up at curbside hard rubbish collections. highest speed using 40 watts at 1,800 revolutions per minute. 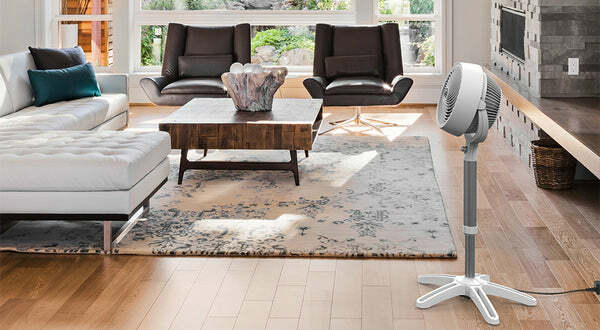 Unlike regular fans, Vornado fans are designed to provide whole room circulation. 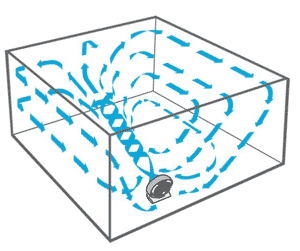 They call the resulting airflow "Vortex Action." Many people find fans can help them sleep. This includes both hot sleepers and those who enjoy some level of white noise. With the Vornado’s precise speed adjustability, just the right level of airflow or white noise can be set. For overnight use, the energy savings really add up. The Vornado 683DC provides useful airflow with as little as 5 to 10 watts of power. Contrast that with the 40 watts (or more) used by most pedestal fans, even on their lowest setting. The Vornado 683DC is quieter, more effective, and looks better than other pedestal fans. 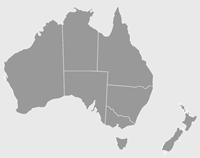 Fan comes with a standard AU/NZ power plug (240 V AC). Internal motor runs off 24 V DC. Product Identifiers Vornado 683DC Energy Smart Medium Pedestal Air Circulator; 43765012871 (Barcode). What about other Vornado fans? Vornado has a wide range of fans but only a few models use efficient DC motors - called the Energy Smart Series. If you're looking for a compact fan, see the Vornado 533DC DC Fan - perfect for bedrooms, home offices, or similar. How easy are they to clean? Vornado fans have a detachable grill making it easy to clean the blades. The fan angle and height are adjustable but they do not oscillate. Instead they're designed to circulate air throughout the room from a fixed position. Vornado Energy Smart DC Pedestal Fan has a rating of 3.5 stars based on 2 reviews.